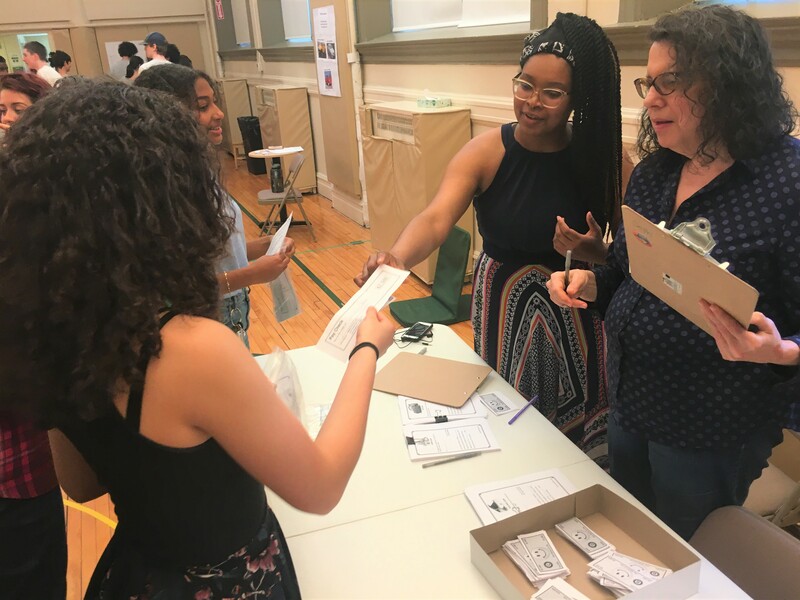 In keeping with our Quaker mission and our commitment to equity, this May the upper school had an immersive experience addressing systemic racism and white privilege. The experience was multi-purpose in that it was a culmination of this year’s Quaker focus on “justice” and served as a response to both a call to action by students and that of our Diversity and Equity Statement and Action Plan. In two half groups on two days, our upper school community viewed the documentary, “I’m Not a Racist, Am I?” and engaged in facilitated dialogues and activities. The upper school students began this field studies day with a timeline activity in which they sequenced undated US immigration and citizenship laws. Students rearranged the events and reflected on the patterns they observed, and the often-surprising timing of certain laws. Then, students viewed short videos on the 1940’s practice of red-lining and looked at interactive maps from the time. After a break, the students regrouped in the gym to view the documentary “I’m Not a Racist, Am I?”. In the film, twelve teenagers from New York City come together periodically for a year to talk about race and privilege in a series of workshops and in conversations with peers and family members. Filmmakers André Robert Lee (Director) and Lenny Walker (Director of Programming) introduced the documentary and stayed to facilitate a dialogue with our students and faculty. They helped process some of the concepts and answered questions. On both days, students demonstrated their engagement with the film and their willingness to be open and to sit in the discomfort that often arises in conversations about racism and white privilege. They asked thoughtful and expansive questions and shared their feelings about some of the events in the film. They were curious to know what happened in the teenagers lives over the last few years and were pleased to learn of their continued friendships. To further support the conceptualization and processing of the ideas, the day concluded with an interactive activity called “The Game of Life.” Students were assigned lists of symbols that corresponded to various social identities. Without knowing their identities, students were given the task of moving through various stations to try and become as “successful” as possible. Stations included education, banking, and employment, along with the self-service stations for car and house purchases. Students could also visit the courthouse to get IDs or to get married or divorced. MMFS staff and faculty members staffed the stations and students were either successful in their endeavors or were rejected from their attempts to get a degree, for example, based upon their symbols of not having a high school diploma. Some students were arrested by patrolling officers and some students had connections that allowed them to get to the head of the line. The simulation was an engaging way to experience the advantages and disadvantages encountered by people in the real world. In our debriefing sessions after the activity, students were excited to share how they did, how they might have gamed the system, and to discuss the “injustices” they experienced. While many students expressed that they enjoyed the activity, those same students were also very reflective about the experiences that they had and were able to draw parallels to the injustices that people (even some in our own community) face on a daily basis. “The Game of Life” addressed the gravity of systemic injustices that exist in our society with the developmental needs of adolescents in mind. The activity made space for our community to develop a greater sense of empathy. This important field studies day was the culmination of this year’s focus on the Quaker testimony of justice. While this event rounds out this academic year, our work to explore issues of equity, diversity, and social justice are core to our mission and will continue every year.